He stalked through the grasses, ears cupped, head down. Then he squatted, still listening and looking. Steve Rannels was pursuing crickets and katydids behind the Middle Creek Management Area’s Visitors Center. My husband Bruce and I had been fascinated by the compact disc Rannels, Wil Hershberger and Joseph Dillon had recently released entitled “Songs of Crickets and Katydids of the Mid-Atlantic States,” so we had arranged to meet Rannels and his wife Sharon at Middle Creek for several hours of intensive cricket and katydid field identification one warm summer evening. As soon as Rannels spoke, we recognized him as the voice on the CD. He explained that he had started the project in 1994 and recorded 30 species before meeting Marylander Wil Hershberger the following year at a Cornell Library of Natural Sounds two-week recording workshop. Hershberger then added selections from his Frederick, Maryland locale and worked with Lebanon Valley graduate student Joseph Dillon on the audio engineering. Altogether, they had recorded 40 species for the CD. “I spent long hours getting them,” Rannels told us. He had bought covered Tupperware dishes, cut out the plastic between the ribs, and replaced it with nylon mesh. Each insect he caught, he put in an altered Tupperware dish. Then he took it home and placed it on a big, stuffed chair that absorbed the sound. In the dark, he pointed the microphone at the insect and ran tape until it called. Some were more difficult to record than others. Sometimes he had to wait long hours in his hot, un-airconditioned, closed house for an insect to sing. Rannels is a native of Lititz and now lives in Hershey where he works as a physiologist at the Hershey Medical Center. An avid birder, the tall, thin, curly brown-haired Rannels is a member of the Lancaster Bird Club and often leads birding trips for them. Unlike birds, though, many look-alike species of crickets and katydids can only be identified in the field by their songs. For instance, until the 1930s, entomologists believed that all field crickets in North America belonged to one species. Then, a researcher in North Carolina discovered that there were four species which he called the triller, the woods cricket, the mountain cricket, and the beach cricket. Another researcher added two more species. All showed differences in singing pulse rates and patterns except for the northern spring field cricket and northern fall field cricket. Those species are identical in physical characteristics and song, so Rannels says that if he hears a field cricket chirping before July 15, he calls it a northern spring field cricket. After July 15, he assumes it is a northern fall field cricket. Not all the insect choristers are that difficult to distinguish. What the late Vincent G. Dethier, in his wonderful book Crickets and Katydids, Concerts and Solos, calls “this world of trills, tinklings, buzzes, shuffles, crackles, and clicks,” is made mostly by males calling to attract females. They use the file on one broadened front wing and the scraper on the other to produce sound like someone playing a fiddle. Both front wings contain a file and a scraper so, theoretically, they could switch back and forth, but they rarely do. Crickets almost always sing with the right wing over the left and katydids with the left wing over the right. Crickets and katydids hear the songs through a pair of ears called tympana on each foreleg or tibia just below what we would call the knee of the insect. Although the life histories of most cricket and katydid species have not been studied, the courtship and mating of tree crickets in general and a few katydid species in particular has been. Back in 1989, David H. Funk, who had spent ten years photographing and observing night insects near his home in southeastern Pennsylvania, published an article on the mating of tree crickets in Scientific American. He discovered that in answer to a fiddling male tree cricket, an interested female approaches a male from behind because the sound from the male’s fiddling is amplified by and deflected off the male’s wings. When the male senses a female is approaching, he stops singing, turns around, and touches the female with his antennae to make sure she is the right species. If she is, he resumes singing and, according to his species, rocks from side to side or pounds the ground with his abdomen. If she is still interested, she climbs on his back and feeds on a substance he secretes while he mates with her. Pennsylvania seems to be a hotbed of cricket and katydid researchers because it was Davison Greenawalt Grove, a recently retired professor at Wilson College and a native of Chambersburg, who wrote his Ph.D. dissertation on the natural history of the angular-winged katydid. “My interest in this katydid stems from the bug-collecting days of childhood,” he wrote. For much of his life, he has kept wild ones captive and fed them on elm and mulberry leaves, in season, or ivy and lettuce, the former sometimes smeared with peanut butter, out of season. Both male and female angular-winged katydids sing, the female answering the male’s “tick” with a softer call that sounds like the clicking of fingernails. They also check each other out by stroking antennae before mating. The female then lays eggs in double rows on twigs. Those eggs overwinter and hatch in early spring. The young ones look like miniature adults without wings and sexual parts and molt through six instars before reaching adulthood. Although the angular-winged katydid is the most widespread of the 100 United States katydid species and is found throughout the U.S., it is the eastern or true northern katydid that produces the thrumming nightly chorus of August and September. Dethier writes that true northern katydids are “one of the few members of their family that thrive in the neighborhood of human beings.” Early colonists cleared the land, built their houses, and the big, plump, dark green, two-inch long true northern katydids became part of the scene. Those “raucous, argumentative insects [that] reside in small colonies high in trees,” were susceptible to tree spraying for gypsy moths and Japanese beetles. Dethier claims that many colonies were totally eliminated, so places where they used to sing are now bereft of that swelling chorus. But Steve Rannels had a male true northern katydid in a mesh-covered jar to show us. “Aren’t they wonderful?” he asked. Indeed they are. But since we have them by the thousands at our place, we were more interested in the male fork-tailed bush katydid in another jar, named for the U-shaped notch on his tail. This denizen of bushes and tall grasses bordering woods calls mostly in late afternoon, uttering soft “zeep, zeep, zeeps” separated by clicks. 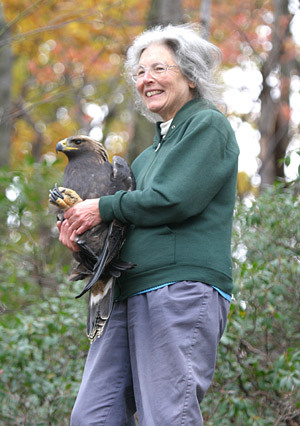 A few minutes later, Rannels found a female in a bush behind the Visitor’s Center. The mixture of long grasses, wildflowers, and bushes in this area provided fruitful hunting as daylight faded. It wasn’t easy, though, because crickets and katydids use vegetation to bounce the sound. Still, Rannels’s persistence paid off. In the bushes we heard the short trills at different pitches ofjumping bush crickets, the “tche, tche, TCHE,” of curve-tailed bush katydids, and the sets of three quick, buzzy pulses of oblong-winged katydids, one of which Rannels caught to show us. The taller grasses and clumps of wildflowers harbored the loudly trilling broad-winged tree crickets, the steady buzzing, like a bee on speed, of a round-tipped conehead katydid, and the musical trill of black-horned tree crickets. But we had to listen more closely to hear the quiet “tick-tick” of a greater angle-winged katydid. At dusk a green heron flew across the rising moon and a V of Canada geese called overhead in the fading, pink sky. That was when we drove down to the wet areas beside the lake to search for wetland species such as the male black-legged meadow katydid that we watched as he buzzed “did, did, did, dzz” on a branch. He had beautiful, long, waving antennae and we could see his wings vibrating as he called. We also listened to the “treeb, treeb, treeb” of a long-beaked conehead katydid in the wetland. Along a back road at Middle Creek we stopped to listen to a northern mole cricket emitting frog-like, low-pitched “chup, chup, chups” from his underground burrow. By then, it was dark, and we had joined a steady procession of deer spotters whose powerful searchlights swept the fields while Rannels’s flashlight swept the roadside. He also drove slowly with his head out the window trying to hear the fiddlers above the background roar from a nearby race track. Once he stopped to show us a jumping bush cricket running down a branch and we listened to the rapidly pulsing, buzzy calls of sword-bearer conehead katydids singing in chorus. He also caught an oblong-winged katydid that had little brown spots on its wings and sang sets of three quick, buzzy pulses. Finally, we drove into a patch of woods where Rannels stopped to scoop a small, light green, less than an inch-long, narrow-winged tree cricket off his wind shield. Then, after hearing a modest, rapid “chi, chi, chi,” he tracked down a round-winged katydid near the ground. At 10:00 p.m. we called it a night. Rannels had identified 17 species for us, but altogether he has found 31 species at Middle Creek–15 crickets and 16 katydids. Of course, all of this encouraged us to identify the crickets and katydids on our property. We made a modest start last August, identifying eight with the help of the Rannels, Hershberger, and Dillon CD. But it was not easy. Still, we have been inspired by Steve Rannels and have made a long-term commitment to learning the insect fiddlers. For more information about “Songs of Crickets and Katydids of the Mid-Atlantic States,” write to Steve Rannels at 237 E. Areba Avenue, Hershey, PA 17543. Or, check the website. Unfortunately there are no field guides to crickets and katydids so the Dethier book is the best written source with its line drawings and identification key of the species he studied.